The Grammy-winning Canadian pianist and entertainer is known as much for the intimate piano touch of best-selling albums Solo Piano I and Solo Piano II as for his showmanship and composition for award-winning stars. Gonzo, as he is known to close collaborators, aims to be a man of his time, approaching the piano with classical and jazz training but with the attitude of a rapper. 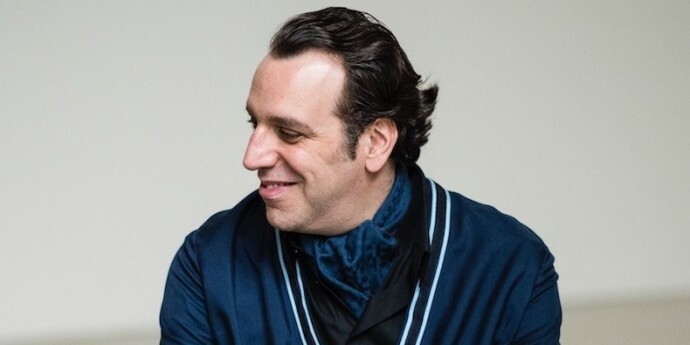 2018 sees the return of Chilly Gonzales to the stage with an intimate hour of pieces from the Solo Piano album cycle, after which he is joined by Stella Le Page on cello and Joe Flory on drums to perform hits and hidden surprises from the rest of his repertoire, interspersed with his unique playful explanations about how music works. Grammy-winning Canadian pianist, entertainer and composer Chilly Gonzales will release the ﬁnal album of his Solo Piano trilogy, Solo Piano III, on 7th September 2018. Known as much for the intimate piano touch of best-selling albums Solo Piano I and Solo Piano II as for his showmanship and composition for award-winning stars, “Gonzo”, as he is known to close collaborators, aims to be a man of his time, approaching the piano with classical and jazz training but with the attitude of a rapper. He holds the Guinness world record for the longest solo concert at over 27 hours. He performs and writes songs with Jarvis Cocker, Feist and Drake, among others, with recent collaborators including the likes of Ibeyi and Toddla T. With Never Stop, Chilly Gonzales composed a global hit for the inaugural Apple iPad 2 campaign. In 2014 he won a Grammy for his collaboration on Daft Punk’s ‘Best Album of the Year’ and composed the best-selling book of easy piano pieces Re- Introduction Etudes. With his last album Chambers, Chilly Gonzales devoted himself to ﬁnding a modern take on chambermusic. Most recently, Chilly Gonzales ventured into a new form of entrepreneurship. A culmination of recent years’ explorations in teaching, Gonzo inaugurated his very own music school: The Gonzervatory. During this all-expenses-paid residential music performance workshop held in Paris, 7 selected students explored Musical Humanism, audience psychology and what it means to be a performing musician in 2018. After a week of intensive coaching, masterclasses and rehearsals, these young musicians performed a concert for an audience of 1500 fans with Chilly Gonzales himself as Master of Ceremony. The Gonzervatory Workshop and Concerts were livestreamed on pan-European TV station Arte Concert to record-breaking audiences (Arte’s 2nd most viewed concert). Plans are already being made for the 2019 edition.